Everyone deserves a peaceful haven at the end of the day. 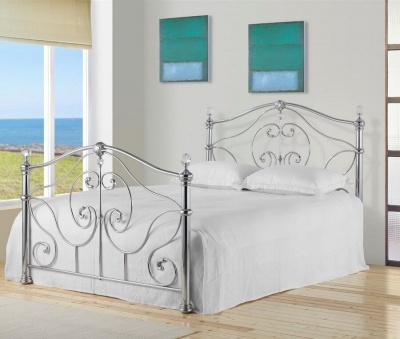 Make yours a glamours space with this stunning bed frame. Black nickel works wonderfully with the exquisite crystal detailing. Traditional design that will be a pleasure to own for many years to come. Sprung slatted base for a good nights sleep. Mainly constructed from plated steel. Black nickel effect plating. Bottom of side rail to floor: 36 cm. Flat packed for home assembly. Full easy to follow instructions included. No extra tools required.